Ice cream remains to be the dessert of choice for many people on a hot summer. It brightens the afternoon and provides the crucial energy boost. Whether served in a cone or scooped, ice cream treats will always bring a smile to your face. 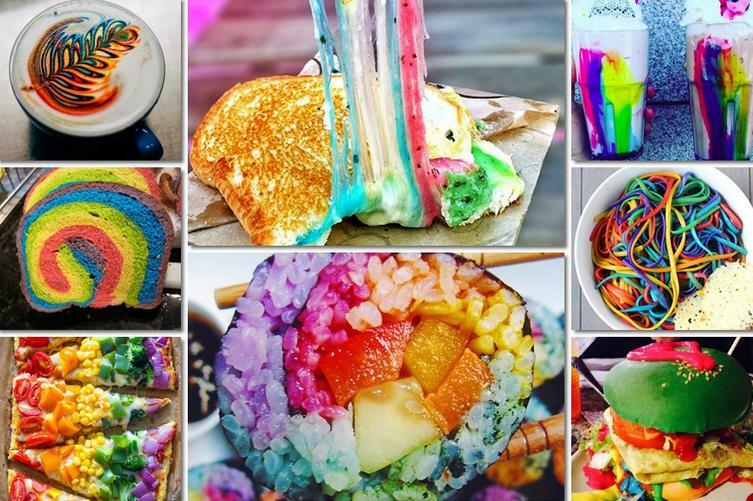 The wide selection of flavors and textures leaves room to experiment and swim by the changing ice cream trends. Ice cream makers, an invention by Agustus Jackson, are making it possible to make any ice cream recipe at home. 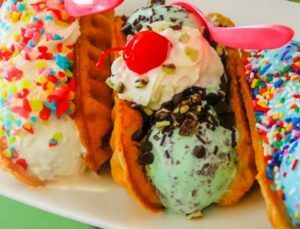 With the wide selection of ice cream makers in the market, there is absolutely no reason why you shouldn’t treat your family to tasty desserts. Homemade ice cream opens up the room for creativity while allowing you to use fresh ingredients. You can always try new ice cream recipes or tweak the ingredients to give the ice cream a personal touch of style and flavor. Making homemade ice cream isn’t a new trend. What’s trendy are the ever evolving ice cream makers. Ice cream makers have truly changed over the years with the nostalgia ice and rock salt cream makers being replaced by automatic compressor ice cream makers. You will be surprised at how technologically advanced the machines are today. Use our detailed ice cream maker buying guide to make the right decision. Which Are The Most Popular Types Of Ice Cream Machines? Though the referred to as traditional ice cream machines, nostalgia ice cream makers are still trendy. These rock salt and ice makers bring the vintage look while accessorizing your vintage interior décor. For handy workers, these sound like the best ice cream makers. They give one the opportunity to whip the ice cream by hand. You will be engaged in the ice cream making process from the beginning to the end. Traditional ice cream makers are known to be family machines. It’s always fun having the family around as you make the ice cream. The kids will help with the hand crank as you work on the ingredients. The summer will be memorable not only because of the tasty desserts but also the involvement in the ice cream making process. Continuous cranking takes 20-30 minutes for a homemade ice cream machine to produce a batch of ice cream. This is considerably long especially if you are relying on the kids for the manual churning. As the ice cream gets hard, the kids will tire and you can expect to finish off the churning process. 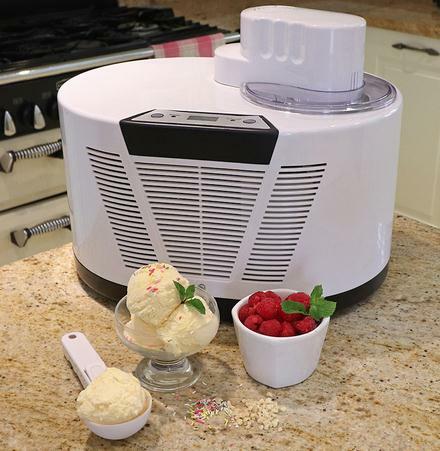 Unlike traditional ice cream makers, compressor ice cream makers make work easy. These ice cream makers are fitted with electric refrigerators. The refrigerators make it possible to make continuous batches. This eliminates the delays experienced with frozen bowl ice cream makers. 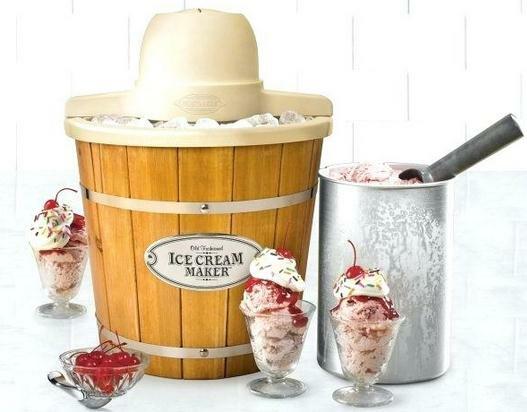 Compressor ice cream makers cool the ice cream canister instantly allowing the user to change flavor on the go. This means that you can serve different flavors from the same machine without necessarily having to change the ingredients. This allows flexibility and delivers beyond the users’ expectations. This is an ice cream maker that is fitted with a container. This container is filled with a cooling substance that needs to be frozen 24 hours prior the ice cream making time. This sounds like a long wait but once the gel is frozen ice cream making is fast and easy. The option of making multiple batches with such a machine can be a little tricky. This would require you to get a huge machine that has numerous compartments. This is because the gel doesn’t stay cold for long and might need re-freezing before it can finish making a second batch. This is a fun-packed easy way of making ice cream. It works perfectly in camps and picnics where space and bulk packing may be restricted. These ice cream balls are quite small and offer the convenience one may need while out in the woods. The ice cream balls are small plastic globes with screwed top openings on both ends. To use them, put ice and rock salt in one end of the ball and ice cream ingredients in the other. Roll the ball continuously until when ice cream is formed. The ice cream making process used in ice cream balls is similar to that in traditional ice cream makers. The only difference is the cranking process. The balls make it more fun and will be less messy. 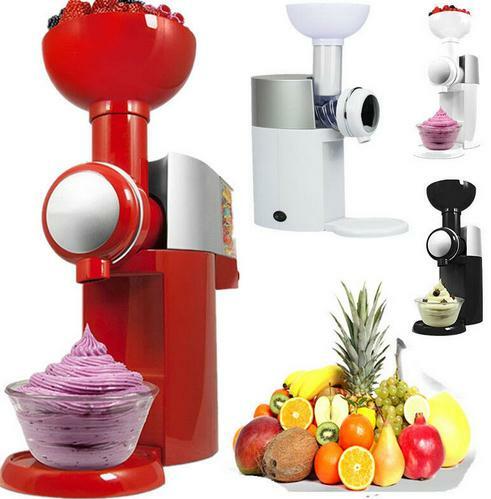 What Should You Consider When Buying An Ice Cream Maker? This is the ancient technology that made it possible to keep the pots cold during the entire ice cream making process. Here, the bowl would be kept in a freezer for 24 hours. No specialized equipment is needed. This makes the machines that use this technology relatively cheap and easy to use. The soft serve technology is more advanced than the traditional one. This is the technology used to produce ice cream treats that require no freezing after churning. The ice cream is served is served directly from the machine. With the soft serve technology, you can continually serve ice cream without worrying about the consistency. In some ice cream maker models, you might need to use rock salt and ice to complete the ice cream making. This is the latest technology in the field of ice cream making. It is a technology that has taken the industry by storm and is making a huge impact. With this technology, you do not need to bother freezing the ice cream. The machine keeps the ice cream frozen and will make continuous batches. These are the machines that will meet any ice cream demand without much of a stretch. Ice cream treats are sweet. You therefore need to ensure that you are making enough for everyone. With the right ice cream maker capacity, this shouldn’t be a problem. A small canister ice cream maker can comfortably make small batches for occasional treats. On the other hand, compressor units may be needed for high demand supplies. This is probably the biggest factor that you will consider before purchasing an ice cream maker. Homemade ice cream machine prices can range from $20-$200. This is a huge range and you need to be sure that you are getting something that is within your budget. A decent ice cream maker with a motor and extended use can be a little expensive but you can be sure of getting one. The appliances are quite diverse and it shouldn’t be hard for you to secure a durable maker that fits in your budget. 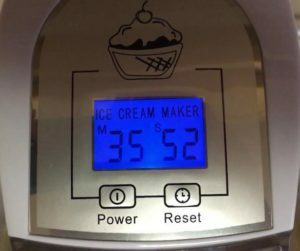 When selecting a homemade ice cream machine, it’s important to consider the time it will take you to get your ice cream. Does the machine require pre-freezing? How long does one batch take? Can the machine make two batches at a go? While some ice cream makers will make ice cream on the fly, others will require more than 24 hours to make a single batch. Analyze your needs are settle on the maker that won’t disappoint. The ease of use is highly dependent on the technology. Well, this is not to mean that the highly sophisticated machines are the easiest to use. 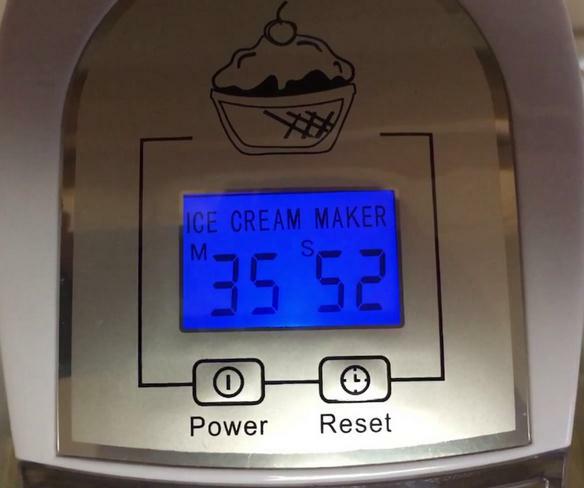 To a layman, a hand crank ice cream maker would be easier to use than a compressor maker with a digital display. When it comes to the ease of use, you would need to go for the machine you are comfortable with. Generally, electric ice cream makers are known to make work easy. They eliminate the hassle of whipping the ice cream by hand. This makes work easy and allows the user to indulge in other activities as the ice cream cooks. Choosing an ice cream maker can be a little challenging especially if it’s the first time you are interacting with the appliances. These machines are quite diverse and come in different shapes and sizes. The technology will also vary from one machine to the other making it important to gather enough information before making a purchase. We hope that the pointers will help you make an informed decision and sweeten your creamy treats. Feel free to check out some of the best ice cream recipes here. Enjoy your summer treats!